American Anthem, a 4YO Bodemeister colt trained by Bob Baffert, has gotten 2018 off to a good start, with a couple of nice wins in June. He won an allowance event at Churchill Downs early in the month, and then returned home to California to capture the G2 San Carlos Stakes in his last event at the end of the month. Today, the colt worked a brilliant 5 furlongs in :59.80 at Santa Anita. That was the 3rd best time out of 36 to go the distance. 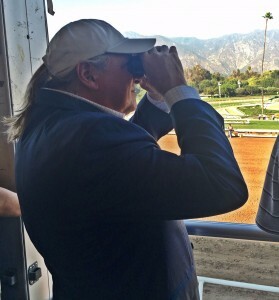 This one seems to have gotten really good now that Team Baffert has focused on one-turn races with this one. Look out for the next try. Third off a layoff can be the best. Dream Tree, who was undefeated and appeared on a roll toward this year’s Kentucky Oaks before being sidelined with an injury, was back on the work schedule this morning at Santa Anita, as well. The 3YO filly by Uncle Mo and trained by Baffert went an easy half mile in :48.20, which was the second best time out of 33 to go that far. This one has not raced since winning the G2 Las Virgenes Stakes at “The Great Race Place” on Feb. 4. But this was her third published work since June 30, and she is working her way back to you. When she does return to the races, she will be putting her 4-for-4 win streak on the line. Patch, the one-eyed wonder by Union Rags and trained by Todd Pletcher, was back on the training track this morning up at Belmont Park. The 4YO colt has raced twice this year, winning an allowance at Belmont Park on May 12, but then subsequently running a disappointing 7th in the G1 Stephen Foster Stakes at Churchill Downs on June 16. Today, he had his second published work since that race, going a half mile in :48.63. That was the 4th best time out of 18 to go the distance. Would not be surprised to see this one surface at Saratoga. Madison’s Luna, a 3YO Tapit colt trained by Phillip Bauer for the Rigney Racing Stables, started his career earlier this year in complete dominating style. He won a MSW event at Tampa Bay over a real good one in Getyourmindright, and followed that with a “green-as-a-gord” and dynamic win in the G3 Hutcheson Stakes at Gulfstream Park. But he came back with two 10th place finishes in the G3 Pat Day Mile and the G2 Woody Stephens. Trying to right the ship, the connections moved him to the grass last time out and dropped back into allowance conditions. Both changes seemed to help as he ran a solid second to Dubby Dubbie — who showed up in a Stakes event on the green at Arlington Park last weekend. Today, Madison’s Luna was back in work mode at Churchill Downs, going a half mile in :48 flat. That was the second best time out of 47 to go the distance over the dirt track. Watch out for this one. Raw talent.